Nothing would make me happier than rolling up my sleeves, donning some protective eye wear and constructing a wood farm table out of raw materials. But I’ve come to terms with the fact that this won’t happen anytime soon. 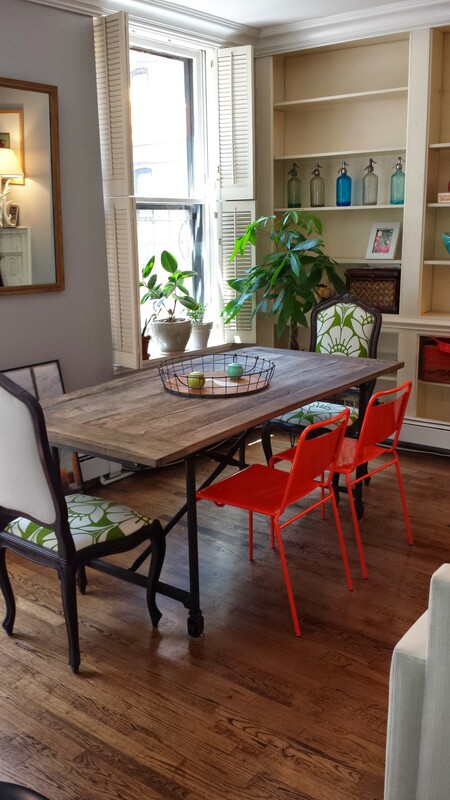 Luckily there are great dining table choices out there , from the handmade variety on Etsy to the big box retailers. 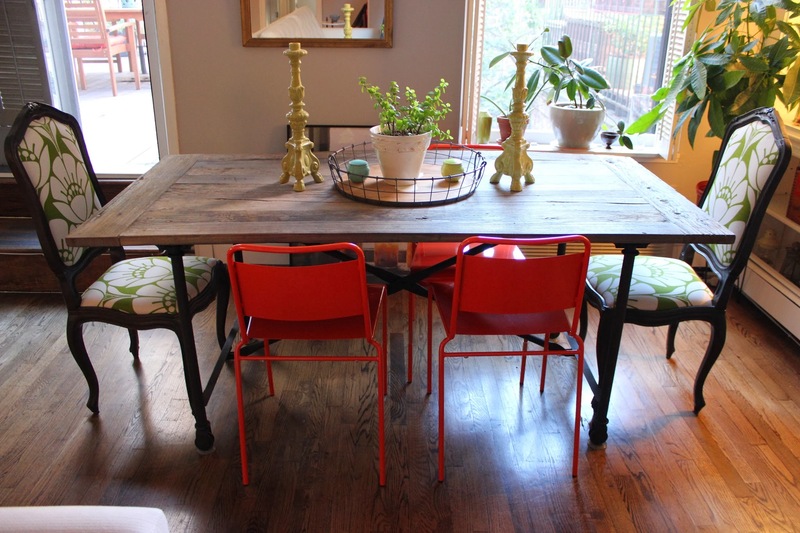 I decided on something in between and chose this number from Restoration Hardware, the Flatiron Table with rust legs. It’s made from a reclaimed elm door so it has a nice wear to it. When choosing my chair arrangement, I decided on a mix of old + new. The bright powder-coated steel chairs are from CB2, and they pack a punch of color inside, and double as extra seating outside. I’ve had the wood chairs with me for 7+ years. They’re original finds from Housing Works that I stained and reupholstered in a simple printed fabric from Calico Corners. My advice here: don’t be afraid of mixing genres or styles, as long as there’s something that ties them together. For me, the coral was an extension of a prevalent color theme I’d already established. And the green chairs felt organic, pulling color from the plants inside and outside. And I love both equally. 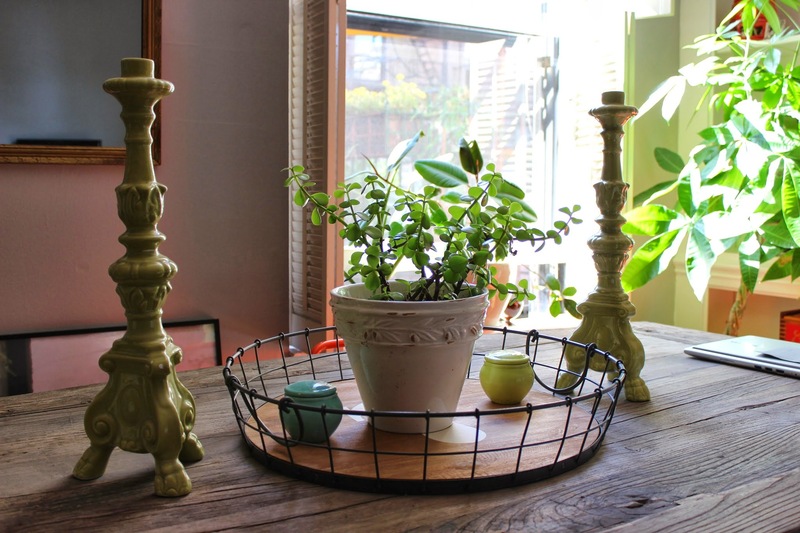 When you love an item, it will always work in your space.